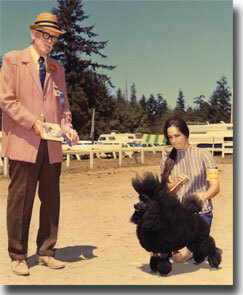 Ch Kathy's Black Scamper was Bar King's first finished champion. He was adored and loved, the sweetest dog there was. 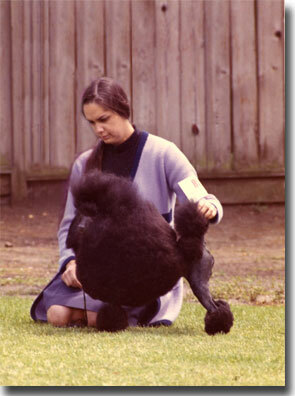 Scamp was shown in the day of extremely long coats with very little trimming. 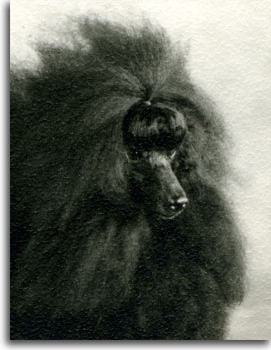 Scamp was a little hair machine, his main body coat almost dragged on top of his leg pompons. Below Phyllis Greer finishes Scamp to his championship. Ch. BarKing's Cinder's Fella, Cinder pictured above, and Ch. Bar King's Cinder's Ella, Ella pictured below. 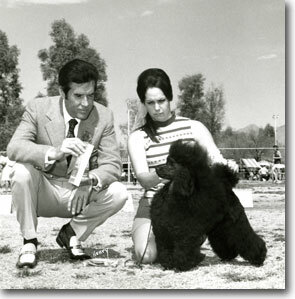 Kathy showed both these dogs to finish their championships. Both are "Top Producers". Note how the trims are starting to shorten up. It made the dogs look mush neater and the dog under the coat was easier to see. Ch. Bar King's HiLili is an Ella pup and she is the littermate to Bar King's Kier (pictured below Darby) and Bar King's Flower Child, both top producers. 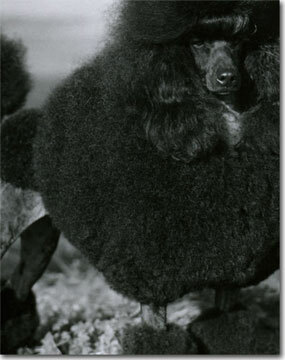 Their sire, Ch. 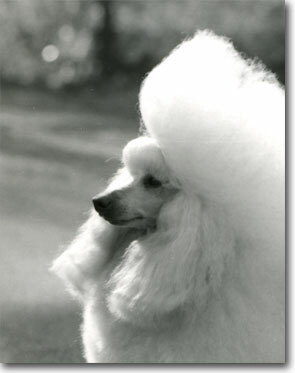 Bar King's Darby O' Quinn, is where our white Miniature Poodles start from. 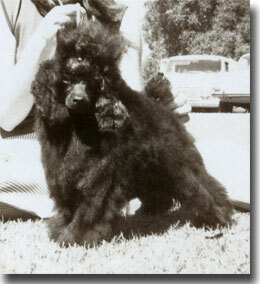 Lili was a beautiful Miniature Poodle and very much the type that we breed for. 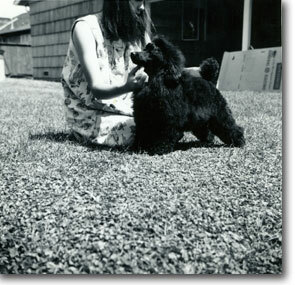 Darby was a great dog in his own right with a fantastic temperament. 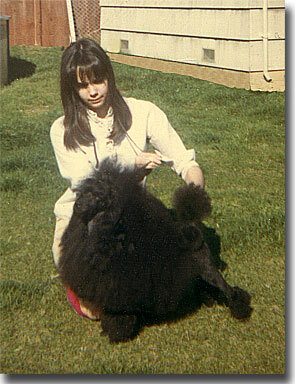 Lisette was breed to Ch. 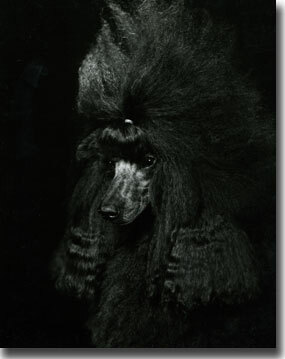 Sandelyne Smedley, this introduced the brown Miniature Poodle to the Bar King foundation, Ch. Bar King's Georgie Girl. 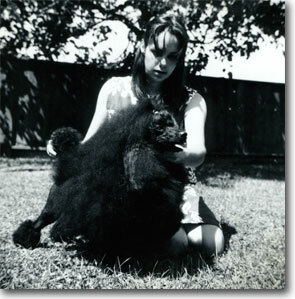 Georgie is the grand-dam of Ch. Bar King Sugar Bear Brown. 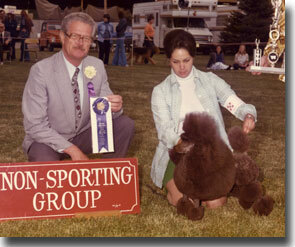 The brown gene survives today, we still produce and show a significant number of brown Miniature Poodles, the latest and greatest is Bar King's Laila Belle Brown. Above is another Ella pup, Ch Bar King's Heirloom. She was elegant, graceful and had a wonderful temperament. 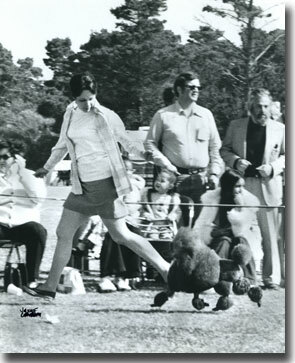 Below is Bar King's Polk Salad Annie, a Scamper pup that was small enough to show as a toy. 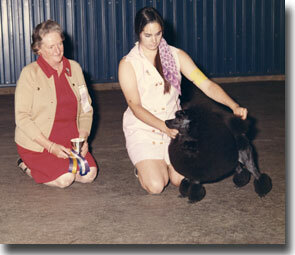 She was a lot of fun and just a smaller version of her sire.